Chocolate chips: soft cookie with chocolate chips. Double chocolate: soft chocolate cookie with chocolate chips. Vanilla sugar: vanilla sugar cookie decorated with fondant. Our cookies are made without the top 10 food allergens, are gluten free and completely vegan. Perfectly golden and soft, flavorful, light, and crunchy, our delicious cookies are made to suit all tastes! 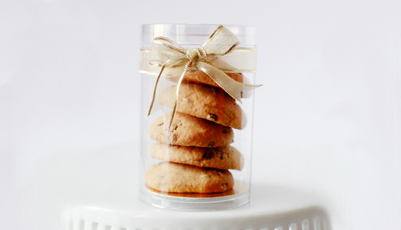 *For customized cookies, do not hesitate to contact us to sand up a tasting where we will discuss your project. We will give you suggestions according to your taste and budget.